While we often associate tooth decay with cavities forming in a tooth’s visible or biting surfaces, the occurrence of this all too common disease isn’t limited to those areas. Cavities can develop in any part of a tooth exposed to bacteria. Gum recession, the shrinking back of the gums from the teeth, can cause such exposure in areas normally covered by the gums. Because these areas are usually more vulnerable to infection when exposed, cavities can develop at or right below the gum line. Because of their location it can be difficult to fill them or perform other treatments. One way to make it less difficult is to perform a crown lengthening procedure. While the term sounds like we’re increasing the size of the tooth, we’re actually surgically altering the gums to access more of the affected tooth surface for treatment. It’s typically performed in a dental office with local anesthesia by a general dentist or a periodontist, a specialist in the gums. During the procedure, the dentist starts by making small incisions in the gums to create a tissue “flap” that can be lifted out of the way. This exposes the underlying bone, which they then reshape to support the gum tissue once it’s re-situated in its new position. The dentist then sutures the gums back in place. Once the gums heal, the decayed area is ready for treatment. Crown lengthening is also useful for other situations besides treating cavities. If a tooth has broken off at the gum line, for example, there may not be enough remaining structure to support a crown. Crown lengthening can make more of the underlying tooth available for the crown to “grab” onto. It’s also useful in some cases of “gummy smiles,” in which too much of the gum tissue is visible in proportion to the tooth size. 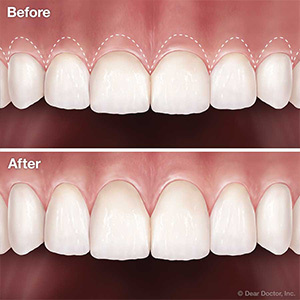 Because crown lengthening often involves removing some of the bone and is thus irreversible, you should discuss this procedure with your dentist in depth beforehand. It could be, though, this minor procedure might make it easier to preserve your teeth and even make them look more attractive. If you would like more information on crown lengthening, please contact us or schedule an appointment for a consultation. Could Crowns Or Bridges Help Your Smile? Did You Know? Minor Tooth Contouring and Reshaping Can Enhance Your Smile! Can You Whiten Traumatized Teeth? Senior Health: Testing Your Oral Health Expertise? Are Dental Implants Okay For Teenagers? Test your knowledge: How Much Do You Know about Mouthguards? Early Detection of Oral Cancer Increases Survival Rates by 400 Percent! Take This Quick and Easy Self-Test NOW!